1.Foster Brothas 2.8/5. I'm digging the beat. 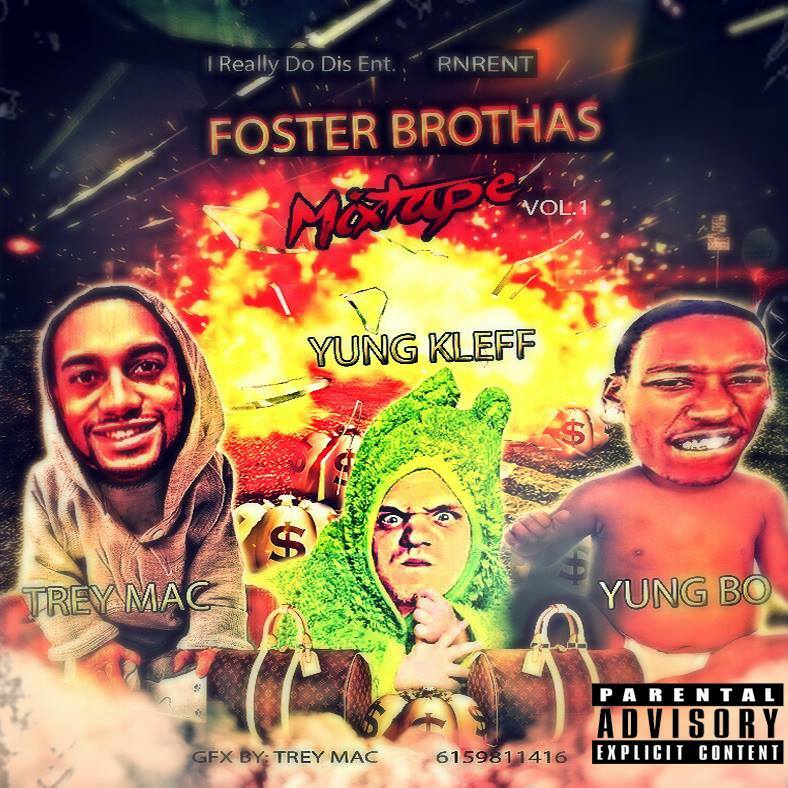 Yung Bo comes hardest here I feel with Yung Kleff keeping up the pace well on his verse and Trey Mac delivery a trademark super flow. The Chorus left a bit more to be desired imo. 2.OMG 5/5 From the moment this track kicks in you can tell it's LIT! feels like BIG SEAN as produced by MIKE WILL MADE IT. Trey Mac comes in with a nice flow bouncing off of BO's delivery and holding his super flow back for a more swagged out approach. Feel like the song could've used a third act breakdown but this is a mixtape and this was a nice way to set things off early. 3.Tim Duncan Remix 4.8/5 Trey Mac delivers a hype asf hook, but his delivery seems a bit off yet he bounces back n forth somewhat decently it isn't bad it's just jarring Yung Kleff sounds like the spiritual cousin of Yelawolf if anything here.."I like dope money better"..was a pretty sick moment in this song out of nowhere...nice touch. Yung Bo verse is lit and def seems to stand out on the tape. A buttery commercial flow def stands up well along with Trey Macs Crunkerthanlife raps while so far Yung Kleff seems to be the token white henchmen which is not a bad comment at all. He brought the breakdown of "I like dope moeny better" and that could be a song all on it's own if it already isn't and I appreciated the touch. 4.See It In You 4.5/5 Hook is comical and swaggerific which to me is the hero of the song, Trey Mac blasts through with his trademark energy so quickly there's no time to judge cause it's so hype which works in it's favor, if your intended fanbase likes to get turnt and turn up this more than serves that purpose. Yung Bo comes with the same energy a level up here but so far I def enjoy his flows at a mild pace because of his smooth delivery. Still that doesn't ruin the song or make it a bad one. It's one of the best hooks I've heard from the collective so far. 5.Hanging Out In The Stix 1/5: "Gettin Twisted like a lid" best moment of this song. 6.Tennessee 4.4/5 Beat is the star here and the song is solid with nods to Tennessee Rap legends 8 Ball and MJG. Nothing is bad here Nothing is mind blowing but it's a solid track. 7.Old Days 3.5/5 Sounds lifted straight out a 90s album, Like the sentiments and what's being talked about. I felt like more heart was needed hear but that's just my op. It's still a real track. 8.Way Back 3,3/5: Seems like a crunk version of the track came before it. I'm a novice to Kleffs music the hook is a nice idea I just dislike some lyrics here and there. 9.Dolla Signs: 4.2/5: Beat is sick def brings the album back from the solo track detour and it's nice to hear the guys together. Solid Track everyone does they thing. 10.Popeye 3.8/5 This song could've used some back up vocals on the hook and singing and I think it would've been a super hit! I wanna love it but it really needed that touch, GREAT IDEA..missed oppurtunity imo. maybe in the right setting it sounds dif but it really would've been radio material with the dubs imo. Proud of the quirky song here though this is def my type of tongue in cheek mainstream music. 12. Michael Jordan 2/5 not my jam. 13. One Night Stand Lover 4/5: Trey Mac kills it here, "Love is a drug, I say no to love" nice flip on the "Say no to drugs" PSA. Lyrics a bit too raunchy in places for the delivery, maybe an RnB crooner somewhere in the background could've elevated this track even higher but it's a solid track that will get the naughty girls going more than anything. 14.Don't Kare About You 2.5/5 : BEAT KNOCKS, Hook could be better. Tmac has a good first verse with a nice hi-pass sound to the vocals. Yung Kleff "wearin an old school Motley Crue shirt now you know I'm bout to rock" Kleff sounds more into his verse here and focused than on some of the previous cuts. 15.What U Need 4.6/5 Hook is def radio ready, beat is bonkers and dramatic, Everyone involved does they thang solid and it's def a banger! 16.MoneyPowerRespect 4.8/5: Trey Mac takes a chance wit his delivery again and I only feel more dubs woulda made it shine even more but I LIKE IT I just wanna see dope catchy creative hooks like this shine as much as they can, Love it really, grows on you even more as the track plays. Very good track. 17.Told You: 4.7/5: Hook and Beat Solid, def sounds like it would rock the club or performed live! Turnt mainstream track aimed at the naysayers. 18.She Bad 5/5: One thing Trey Mac def enjoys is rapping about them freaky ladies and I'm sure those ladies can get down to this with no problem, Trey Mac does his thing here and truly shines. Hook is golden. 19.No Way Out 2/5 Trey Mac kills his verse well and is the saving grace but other than that the song is not the greatest on the album. Summary: Clearly all these guys have things going for them, I see the flashes of a clique on their way to mainstream success when all the layers fall together just right. I think it's clear to see the best songs were also focused on more here, have better mixing and when everyone brings their A game it's definitley enjoyable hype music you'd expect to come out of Ten-A-Key. My review was one of honesty and I respect all guys involved. Def Worth listening for a handful of these tracks are certified fresh! This is just a mixtape and it's just volume 1 so that's something to think about. I hope to see these guys keep pushing their craft and try and amp it up to new hieghts on the next installment until then this tape bumping like "OH MY GOD!"